A massive island nation off the southeast coast of Africa, Madagascar is home to thousands of animal species found nowhere else – lemurs being the most famous, and most appealing. Often called the “eighth continent” by ecologists, this unique island also offers beaches, deserts, and forests – rainforests and spiny forests with ancient Baobab trees. The people are a mix of Malayo-Indonesian, African and Arab, but since the French colonized it in the 16th century, French, along with Malagasy are the spoken languages. The climate is generally tropical yet temperate; with November to April being more hot and rainy, and May to October being cooler and drier. 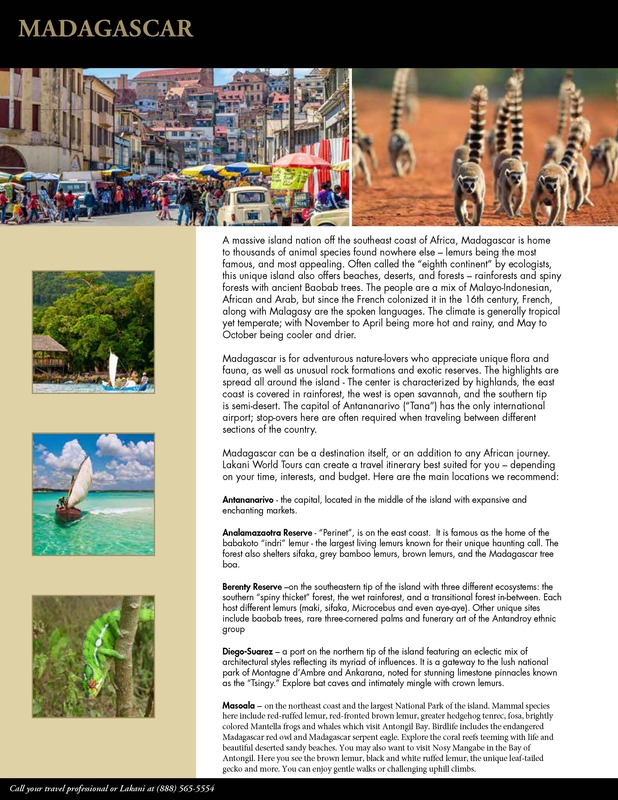 Madagascar is for adventurous nature-lovers who appreciate unique flora and fauna, as well as unusual rock formations and exotic reserves. The highlights are spread all around the island – The center is characterized by highlands, the east coast is covered in rainforest, the west is open savannah, and the southern tip is semi-desert. The capital of Antananarivo (“Tana”) has the only international airport; stop-overs here are often required when traveling between different sections of the country. Antananarivo – the capital, located in the middle of the island with expansive and enchanting markets. Analamazaotra Reserve – “Perinet”, is on the east coast. It is famous as the home of the babakoto “indri” lemur – the largest living lemurs known for their unique haunting call. The forest also shelters sifaka, grey bamboo lemurs, brown lemurs, and the Madagascar tree boa. Diego-Suarez – a port on the northern tip of the island featuring an eclectic mix of architectural styles reflecting its myriad of influences. It is a gateway to the lush national park of Montagne d’Ambre and Ankarana, noted for stunning limestone pinnacles known as the “Tsingy.” Explore bat caves and intimately mingle with crown lemurs. Masoala – on the northeast coast and the largest National Park of the island. Mammal species here include red-ruffed lemur, red-fronted brown lemur, greater hedgehog tenrec, fosa, brightly colored Mantella frogs and whales which visit Antongil Bay. Birdlife includes the endangered Madagascar red owl and Madagascar serpent eagle. Explore the coral reefs teeming with life and beautiful deserted sandy beaches. You may also want to visit Nosy Mangabe in the Bay of Antongil. Here you see the brown lemur, black and white ruffed lemur, the unique leaf-tailed gecko and more. You can enjoy gentle walks or challenging uphill climbs. Visit the Analamazaotra Reserve, home the babakoto “indri” lemur, the largest living lemurs. See the unique baobab trees and rare three-cornered palms of the Berenty Reserve. Explore the bat caves of Diego-Suarez and see the stunning “Tsingy” limestone pinnacles. Relax on sandy beaches or swim among bustling coral reefs in Masaola.